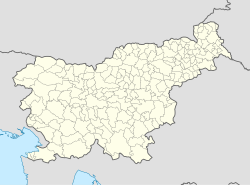 Velika Polana (pronounced [ˈʋeːlika ˈpoːlana]; Hungarian: Nagypalina) is a town and a municipality in Slovenia. It has been officially designated a "stork village" (i.e., a settlement with 10 or more storks’ nests). It was also the home of the Slovene writer Miško Kranjec. The house where he was born (which is also the tourist information office) can be visited. The village is surrounded by fenland and fields of sunflowers, pumpkins, and wheat. The best way to explore the area is by cycling or walking the numerous trails. The parish church in the settlement is dedicated to the Sacred Heart of Jesus and belongs to the Roman Catholic Diocese of Murska Sobota. It was built in 1924. ^ Vengušt, Jernej. 1919. Seznamek prekmurskih občin (krajev) z označbo pošte in zemljevidom. Radgona, p. 11. ^ "Velika Polana municipal site". Archived from the original on 2007-03-10. Retrieved 2007-02-11. This article about the Municipality of Velika Polana in Slovenia is a stub. You can help Wikipedia by expanding it. This page was last edited on 22 July 2018, at 04:32 (UTC).